Statdash is all about making your job easier by saving you time. If you've ever found yourself constantly following up with your team members to find out the status of their tasks, then you will love our automated scheduler. 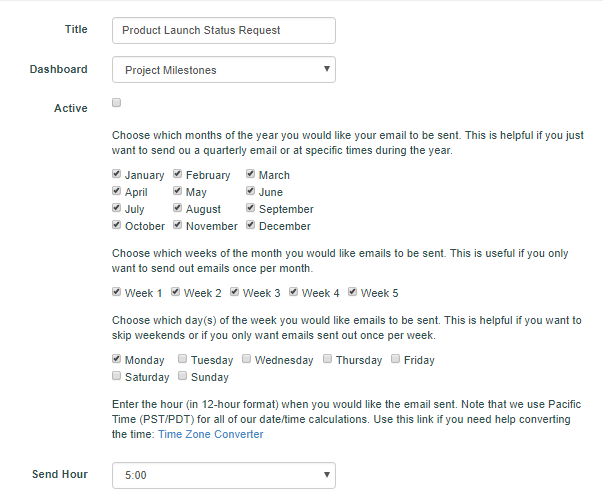 The Statdash Automated Scheduler lets you create a schedule for when you want to send an email to team members to request status updates. You can set the frequency, the day of the week and even the time of day for the email to be sent. You can even setup monthly or quarterly schedules for dashboards that hold information such as training, skills or suggestions.